The following crafts and activities come from The Resource Room. A complete lesson is available to members. 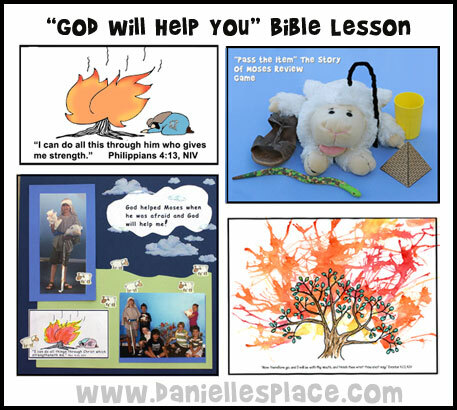 In this lesson a child acts out the lesson as the teacher reads the story. 1. Have children draw a picture of a bush using crayons coloring in the trunk and leaves. 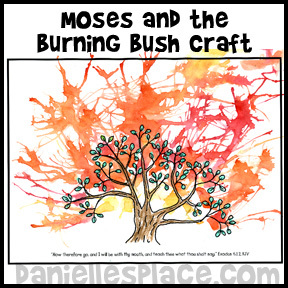 A printable tree pattern with the Bible verse at the bottom is available to members on The Resource Room. 2. Provide yellow, orange, and red watercolor paints. Dilute the paints so they are very runny. Dip your brush in the paint and then hold it over the tree picture until the paint drops on the picture. 3. Show your children how to use a straw to blow the paint in different directions to make it look like flames. 4. You can make your own paint by mixing 4 TBSP baking soda, 2 TBSP white vinegar, 1/2 tsp light corn syrup, and 2 TBSP cornstarch and food dye. Watch a Video on How to Make Homemade Paints. Cup (God told Moses told Moses to take some water from the Nile River and pour it on the ground. It will turn to blood. Have your children sit in a circle on the floor. Hand out all the items, and then have them pass the items around the circle as you play some music for a few minutes. When the music stops call out the name of one item. The child who is holding that items should then tell you and the class how it relates to the story. Keep playing until you have reviewed each item. Display the items from the lesson in front of the room. Tell your children to turn around and close their eyes while you remove and hide one of the items. Then tell them to turn around and raise their hands if they think they know which item is missing. 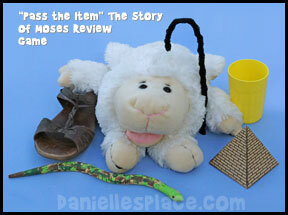 Call on a child to tell which item is missing and how it relates to the story. 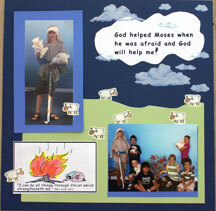 The game comes from the Moses and the Burning Bush Bible lesson on The Resource Room. A complete lesson is available to members. In this lesson a child acts out the lesson as the teacher reads the story.